Enjoy paddle boards, swimming, fishing and exploring from Monument Island to the Keys or Bahamas. 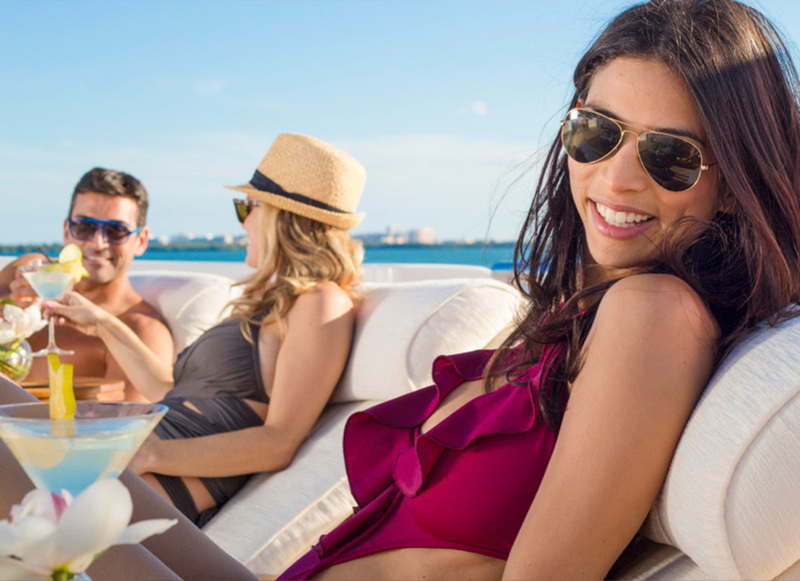 Unwind with a unique, first-class cruise around Key Biscayne. Lounge on pristine private beaches - Bill Baggs Cape Florida State Park has one of the top 15 beaches in the United States. Host a festive pre-game party en route to a Miami Heat, Miami Marlins or Miami Dolphins Game. Rejuvenate with a B&B overnight experience in secluded anchorages or at the exclusive Palm Island Resort. Indulge in the five-star yachting experience while being pampered by our professional crew. Arrive in style at Miami's hottest restaurants, like Zuma, Seasalt and Pepper, Casablanca Seafood or Garcia's, or better yet, enjoy a private gourmet dinner onboard prepared by one of Fleet Miami's amazing yacht chefs. Pickup locations: South Beach, Miami Beach, Bayside Marina, Maimarina, Turnberry Resort, Marlins Park, Fontainebleau, Indian Creek, Bal Harbour, Haulover and Fort Lauderdale.